PepsiCo has hinted that it will soon resurrect "Crystal Pepsi," an ill-fated beverage from the 1990s that some customers have been lobbying the company to bring back. 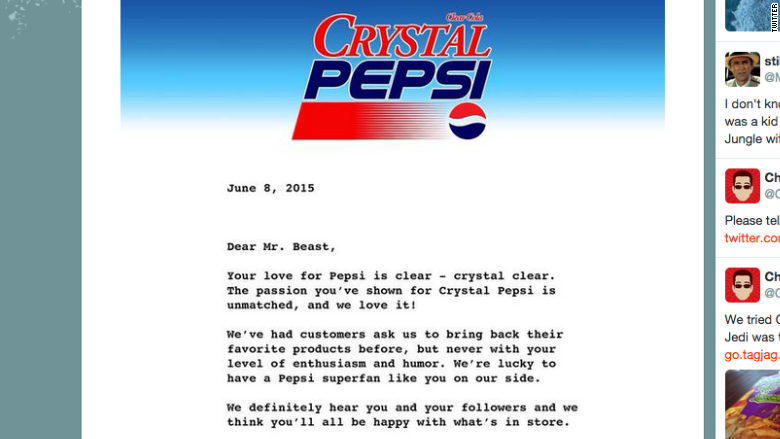 In a letter sent to professional competitive eater Kevin Strahle, who has been agitating for a Pepsi Crystal revival, the company said that fans of the drink would "all be happy with what's in store." Pepsi (PEP) confirmed the authenticity of the letter to CNNMoney. Crystal Pepsi fans cheered the development, which follows an online campaign that asked Pepsi to revive the clear, caffeine-free soda that was available for a short time in 1992 and 1993. A petition on change.org garnered tens of thousands of signatures. "We've had customers ask us to bring back their favorite products before, but never with your level of enthusiasm and humor," Pepsi wrote in the message to Strahle. "We're lucky to have a Pepsi superfan like you on our side." Those superfans were in short supply during the the original short-lived Crystal Pepsi release, which the New York Times described as a "colossal blunder." David Novak, now executive chairman at Yum! Brands (YUM), is credited with dreaming up the idea. He told Fast Company in 2007 that while it was the "best idea" he ever had, it was also the "worst executed." "People were saying we should stop and address some issues along the way, and they were right," Novak said. "It would have been nice if I'd made sure the product tasted good." It seems Novak was wrong about another thing: "Once you have a great idea and you blow it," he said in 2007, "you don't get a chance to resurrect it."